Rancho Malagon or Viñedos Malagon is the newest “shining star” in Mexico’s emerging wine industry having come out of nowhere to receive one of the highest ratings for a Mexican wine in history. One of their three premium wines won a gold this year in the 16th International Wine Competition in Ensenada and their 2006 Reserva received 92 points from Wine Spectator magazine. Their 2006 Equua is a magical blend of 70% old vine Grenache and 30% Petite Sirah, aged in oak barrels for 12 months. Also, they’ve just released their 2007 Equua with a slightly different blend of 80% Grenache and 20% Petite Sirah—very distinct, rich, full of character and of excellent quality. The 2007 Reserva is their most elegant wine, an outstanding blend of 56% Cabernet Sauvignon, 16% old vine Grenache, 14% Petite Sirah, and 6% Merlot, aged in new French oak barrels for 12 months. 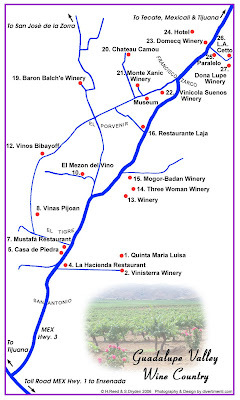 The ranch has been growing grapes for over 50 years and selling the harvest to the larger wineries in the valley. One of the first winemakers to explore these “old vine” Grenache grapes at Rancho Malagon was Jose Luis Durant, Chilean enologist, then the winemaker for Pedro Domecq. Jose is the current winemaker and consultant for Viñedos Malagon where he has created many excellent blends. These remarkable wines can be enjoyed in their charming tasting room, decorated with classic Spanish-style handmade furniture located in a 110-year-old reconstructed adobe Russian house. The tasting room consists of a small wine bar and staffed kitchen, two separate rooms with sitting areas, and two separate patios where guests can enjoy wine and cheese platter service. Tastings are by appointment only and are for a maximum of 8 people. The bed and breakfast facility is centered in a courtyard that features a cantina, private kitchen and dining area with a fireplace. Four deluxe room options are available to meet your specific needs. The “Grenache Suite” features one queen bed, large private bathroom, spacious living room and a private patio looking out into the beautiful private gardens. The “Green Room” includes one queen bed, private bathroom and balcony with a sitting area offering a majestic view of the mountain range. The “Blue Room” includes two full-size beds with one private bathroom and balcony with sitting area featuring a view of the mountain range. Many guests rent the entire complex to host family, friends and clients. Rancho Malagon was originally a Russian homestead established in the early 1900s by Molokan settlers and is a “hidden jewel” located in the village of Francisco Zarco in Valle de Guadalupe. This family-owned 400-acre ranch, vineyards, winery, bed and breakfast gets a gold medal for hospitality, first-class service, romantic ambiance, hidden location and for creating fantastic wine. Visit their website at: http://www.vinedosmalagon.com/ for details, directions and reservation information. Steve Dryden is a wine, food and travel writer living in Guadalupe Valley where he guides private and small group wine tours. He can be reached at: sbdryden@hotmail.com.